The Guardian's decisively pro-action stance on climate change is a break with conventional media insistence on 'objectivity.' Or is it? Six years ago, The Guardian newspaper, based in the U.K., launched its “10:10” campaign, an advocacy program with news content aimed at getting organizations and businesses of all kinds to reduce greenhouse gas emissions by 10 percent in 2010. That campaign followed in a long tradition — long faded in the United States among so-called “mainstream media,” but still alive in Britain — of large newspapers muckraking, rabble-rousing, and explicitly imploring the public to change the status quo on some issue. Other Guardian causes have included pressing the monarchy for an end to Catholic exclusion; an end to corporate tax avoidance; and more inexpensive drugs for the world’s poor. 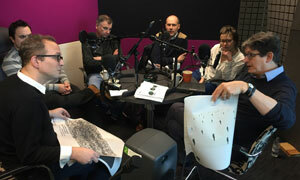 Editor Alan Rusbridger at right (courtesy of The Guardian). Now, at the end of a storied career, Guardian editor-in-chief Alan Rusbridger — who will step down in June after two decades at the helm — has decided to launch one last campaign. It is a kind of multimedia power move that pairs The Guardian’s formidable storytelling powers, massive global audience, and platform with climate campaigner Bill McKibben and 350.org’s global grassroots push around climate change action and divesting from fossil fuel companies. The “Keep It in the Ground” campaign specifically targets the world’s two largest philanthropic organizations: the Wellcome Trust and the Bill & Melinda Gates Foundation. 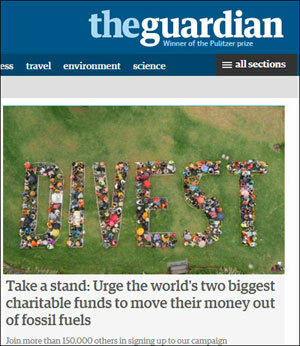 The Guardian campaign asks them to move their investments away from fossil fuels companies. The website subsection features video, text-based stories, updates on the campaign’s progress, and a charming podcast series — influenced by the viral public radio hit “Serial” — that provides a behind-the-scenes look at the Guardian’s own internal deliberations. Rusbridger concedes that the podcast, which features editors and reporters arguing and disagreeing over strategy — and even over whether divestment is a good idea — has made The Guardian susceptible to criticism. Neither the Gates Foundation, a funder of some of the newspaper’s past work, nor the Wellcome Trust has committed to divestment, Rusbridger acknowledged in a public radio “On the Media” broadcast. Even if the consensus science is settled, policy tactics to address climate change are still in dispute. And the reality is that 350.org has specific political agendas and tactics, ones not always perfectly in line with other groups equally committed to mitigating climate change. Some media observers say that, politics aside, the overall media strategy is actually not that radical in its conception — and in many ways is merely catching up to the way many people now consume information online. Many news organizations, including old and venerable “mainstream” ones such as the Christian Science Monitor, have enabled features that allow site visitors to “take action” or “get involved,” making the descriptive reporting more potentially “useful.” (Of course, media companies have few qualms with digital tracking and behavioral ad targeting in order to induce other forms of “action” from audiences: Namely, getting people to buy things.) And it is true that many media outlets openly tout the outcomes of their work — a law is changed, a politician jailed — as a net good in the public interest. Rusbridger is uncertain that The Guardian will ultimately “win” this campaign. In that way, it breaks the cardinal rule that you only start newspaper campaigns in which you know you can succeed. It could be a tough way to bow out for the veteran editor and journalist. Still, there have been small, local victories. And with the Paris climate talks coming up at the end of 2015, Rusbridger says that many have told him they are “really grateful we’re doing this” right now, putting pressure on policymakers to push for more action at a pivotal moment.